How can technology in the classroom help students learn how to learn? For Erin Hill, STEM lecturer and director of the Quantitative Skills Center at UW Bothell, it is important that students get more out of her courses than just subject-specific skills. In 2014, Hill began to look for a technology to incorporate into her classroom that could show and record learning as it happens—and help her students become more aware of, and adept at, the learning process. Her search led her to compare available tools with her needs. 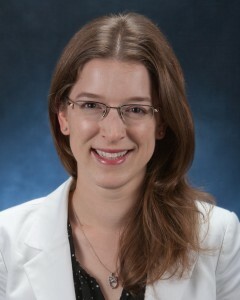 Hill’s courses in physics involve frequent collaborative group work, so she wanted an option that would allow her to move among her students while they tackled problems together. She also wanted a way to seamlessly record, share, and interact with her students, showing their reasoning as they worked in real time—while prompting them to communicate their thinking to themselves and the rest of the class. After consulting with fellow faculty and experimenting with a few apps, a colleague recommended Doceri, an “interactive whiteboard” app for instructors. Doceri turned out to be well-suited to Hill’s course topics and pedagogical goals. Operable from a tablet, the Doceri app displays instructors’ writing in real time from anywhere in the room. 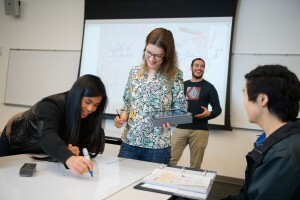 By connecting the tablet to a laptop or desktop computer and the projector, it allows instructors to advance slides, open polling software, or write notes while moving around the classroom. Hill can draw and display examples of the concepts she’s teaching; she can also project snapshots of student work and write on those—making student thinking, as well as her own, visible to the class. Hill can project two groups’ work side by side, then have each explain how and why they arrived at the solution they did. When a group gets a question right, Hill prompts those students to explain not just what they did, but how they knew they could approach the problem the way they did. Doceri records all questions, notes, and explanations in both audio and video so that it’s all available for students to review. Students appreciate that Doceri allows their instructor to be so mobile. That mobility is key to student learning and improves the classroom experience, says Adham Baioumy, a former student in Hill’s Mechanics course who now works as her peer facilitator. Because Hill can move throughout the classroom as she projects and explains concepts—while also sharing students’ work—she helps students feel more connected to the class, and to the concepts at hand, he said. The efficiency of this method is also important because it “allows more time for students to be immersed in a concept,” said Holly Gummelt, Hill’s former peer facilitator and undergraduate student. Hill lists teamwork, communication, and problem-solving among her priorities for student learning goals. But she also emphasizes the importance of learning how to learn from challenges and mistakes. “Part of learning is play—the ability to revise,” Hill said. In Doceri’s whiteboard mode, the app allows students to rethink problems in real time based on discussion and feedback. In Hill’s class, student groups work on small, physical whiteboards; Hill can then display and annotate their work via Doceri as they talk through their own processes and rework the problem themselves. As research has shown, helping students understand why they made errors and how they corrected them fosters better understanding of course content and builds problem-solving skills. Mobility: The ability to move away from the podium and interact with students as they work gives students a sense of connection to instructors and course material; it also allows for efficient sharing of student learning as it happens. Communication: When students are prompted to talk and write about their own learning processes—how they arrived at a conclusion, step by step—it helps them understand what strategies work, and how they can improve the ones that don’t. Flexibility: Learning from errors and challenges can be extremely productive—when students have opportunities to understand what went wrong, articulate the challenge, and revise their work in real time. Visibility: Instructors can incorporate ways for students to see the learning process at work by displaying student approaches to prompts or problems. In addition, making the instructor’s understanding of the content visible—through projecting notes, examples, and interactions with student work—provides students with a window into how experts approach similar problems.